Favorite Boardmaker Studio Gadgets for SLP’s! In the middle of all the snow last week, I went to a training workshop on Boardmaker Studio. I learned a lot of new tricks and I’m happy to share them! The following are some of my favorite Gadgets in Boardmaker Studio for SLP’s. The gadgets are the cool features you can add to your standard buttons to make them perform all sorts of fancy actions. When you open up a new project, you can find Gadgets on the toolbar on the left side of the page, under Symbols. When you click on Gadgets, you see a bunch of folders pop up on the toolbar. Let’s start with the folder labeled Basics. The first buttons you see are: Close Popup Button, Next Page Button, Open Page Button, Play Sound Button, Popup Video Button, Previous Page Button, and Print Page Button. All of these gadgets do what their name says. 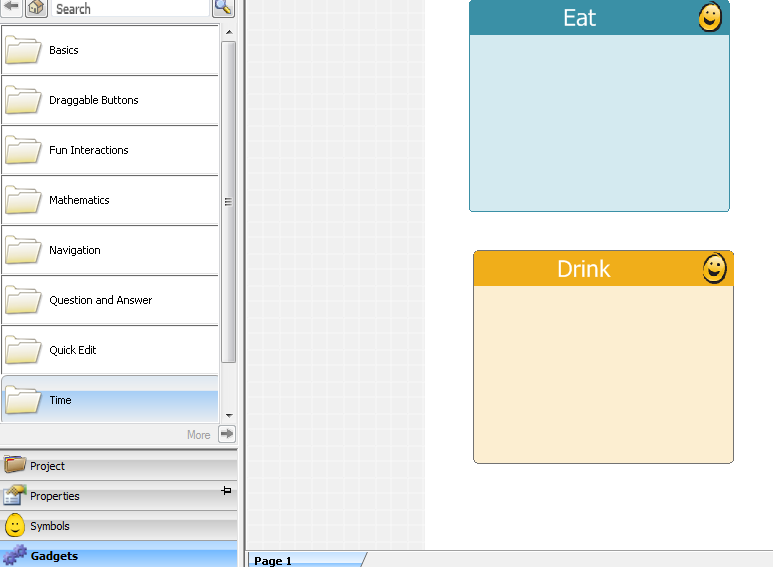 For example the Next Page Button creates an arrow that you use to click to the next page of your project. If you are creating a project that is more than one page, you will need to add a Next Page Button, or you won’t be able to get to that page. I love using the Play Sound Button because you can insert fun sounds into your project to make it more interactive. Boardmaker has a folder of sounds you can chose from or you can insert your own. 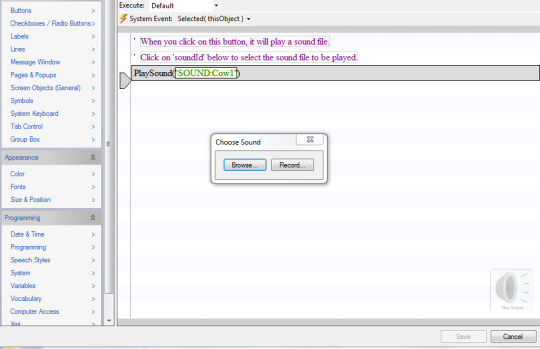 Once you add a Play Sound Button you click on it to select which sound you want to play. 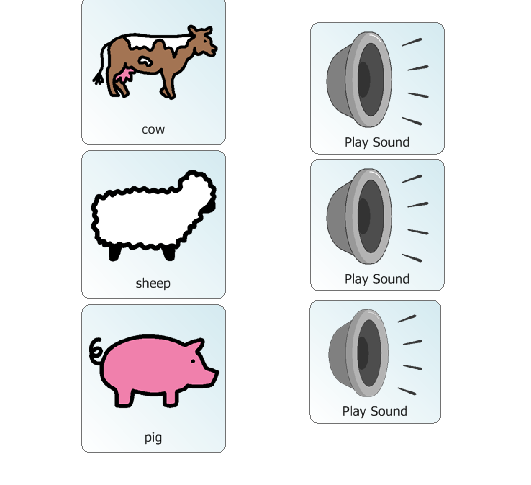 For my farm animal lesson below, I’ve added animal sounds next to the buttons to make the activity interactive. 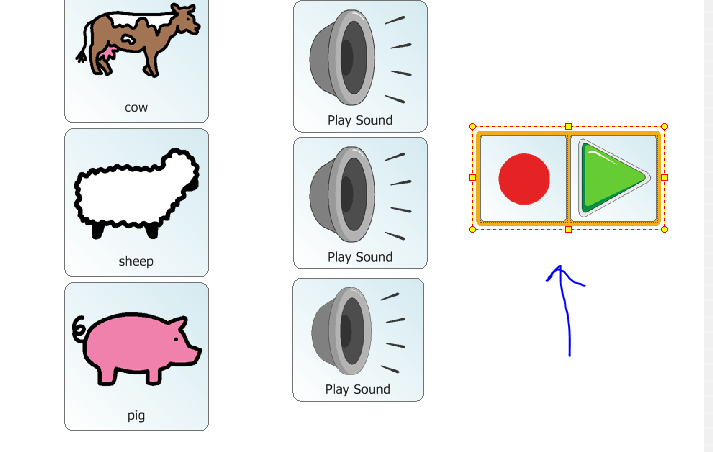 Start by dragging the Play Sound Button onto your project page. Next double click on the button. A pop-up menu appears describing what the button will do. Click on sound Id. 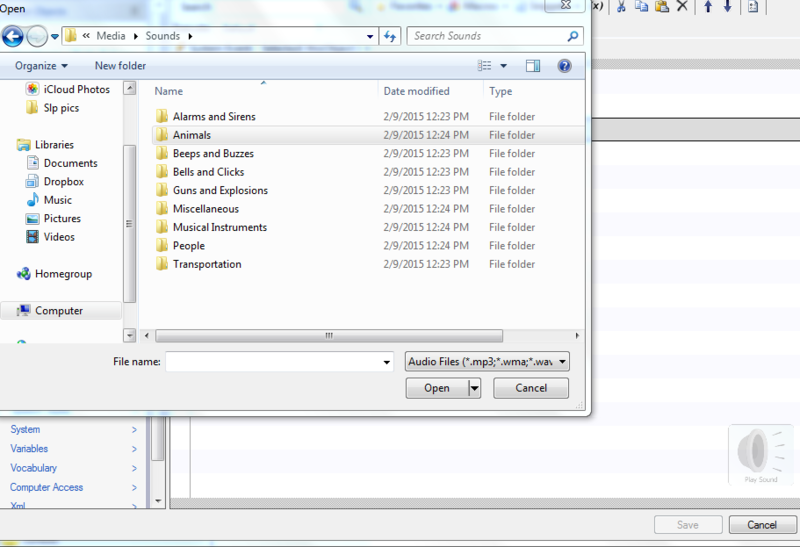 This will allow you to browse through their sound files or record one yourself. I selected browse, and then clicked on the Animals folder. You then pick which animal sound you want, press save, and you’re ready to go! Once you scroll down the toolbar (we’re still in the basics folder) there are even more choices. You can insert a button to read the text on the screen, speak the labels on the pictures, and even record. The Recording Gadget lets students record their own audio and listen to it. So cool and easy to use! Once in Play mode (you have to select play mode- the green play button in the upper right corner- in order to use your project), simply click on the red circle to record and the green play button to hear it back. The Speak Label Button will read the label on your symbols in Play mode. The Speak Text Button is different in that it will speak text that you type in, not just the label on the button. Start by dragging the Speak Text Button onto your project. Add a symbol as you normally would, dragging one that you found from the symbol library. To add in text, double click the button and the pop-up menu appears. Look for “speak text” and click on the orange “text”. Now you can type in whatever you want to be read. In Play mode, you will hear this when the button is clicked on. The next gadget folder is Draggable Buttons – there are two useful folders here- Matching and Sorting. 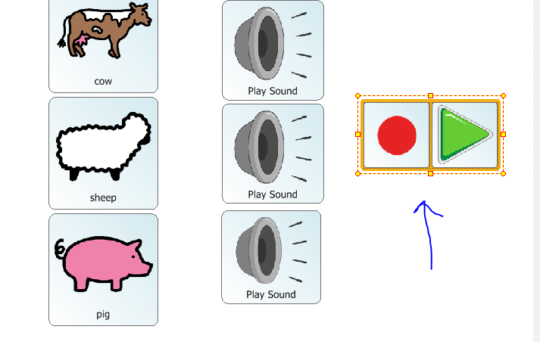 Matching allows you to create a matching activity where you can drag buttons onto their corresponding target button. In Sorting, you can drag items from group A into the Group A bin and the computer will say “That’s right, the item belongs in the category”. You write in the labels and group names. 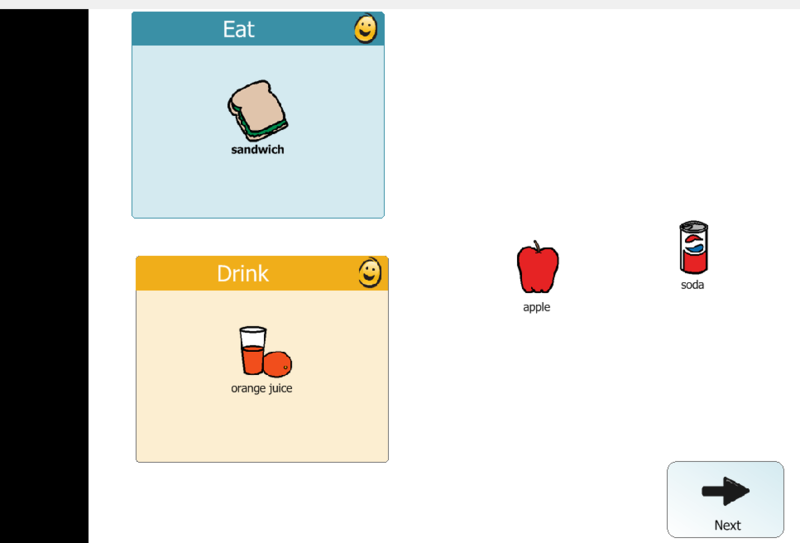 For example I’ve made a sorting activity for food items and drinks. When my student drags the sandwich into the “eat” category, they will hear the praise. If they drag a sandwich into the “drink” category, it won’t go in and will say “This doesn’t belong here”. This is a really fun way to work on vocabulary. The Fun Interactions folder has some cool cause and effect features. The first folder Animations contains different ways to animate your buttons. They can move in various directions across the screen when clicked on. The other buttons allow you to do some funky things with buttons such as change the picture on one button to another using the Change Picture Button, or hide the image and text of a button so it will only be seen once clicked on with the Hide and Show Button. Hotspots are invisible buttons you put over an image to make it clickable. Boardmaker allows you to add sound if you use the Hot Spot Play Sound gadget or read text with the Hot Spot-Talking gadget. Another cool gadget in this set is the Popup Video Button. This lets you add in a video file from your computer or their library. This works just like adding in a sound file. You can either save one to your computer or chose from their selection of reward animations (which are 15 second clips of little animal animations or fireworks). 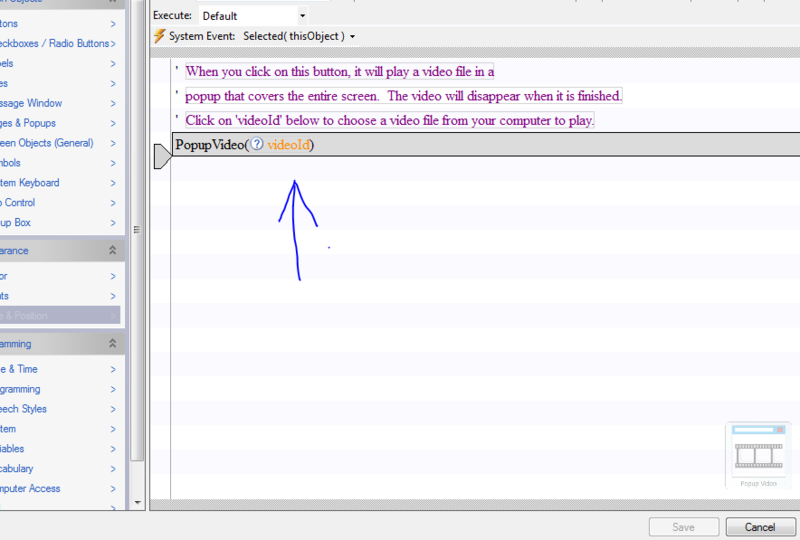 To use, drag the Popup Video Button onto your project. Double click on the button and then click on “video Id” when the popup menu appears. From there select one of their animations or a file from your computer. Again, save your changes and you’re ready! These are some of my favorite gadgets using Boardmaker Studio. Stay tuned for more posts on the many Studio features! As always, check us out on Twitter, Pinterest, and like us on Facebook! Sign up for our mailing list here to stay updated with our latest therapy tips, app announcements, and blog posts.